Lowdown: A formerly rich New York wife stirs everybody up when she crashes on her poor San Francisco sister. I don’t know about you, but I have some specific expectations when I sit to watch a Woody Allen film. Like, I know that I am in for an hour and a half of humoristic chitchat fest focusing around the city the movie is set at. In the past, Allen would base all his movies around New York; nowadays he tries to confuse us by moving from one city to another, but that’s it for surprises. Not so for Blue Jasmine. Sure, the chitchat was there, but the humour? What humour? This one is a rather depressing affair. We follow Jasmine (Cate Blanchett), an obviously affluent and accustomed to affluence woman, as she arrives at San Francisco. It immediately becomes clear there’s something quite wrong with her: she keeps talking about the way things were with her husband; then we learn she was talking to a perfect stranger who couldn’t care less about her; and then we watch as Jasmine continues the same conversation with no one around to listen. Clarifications start coming when Jasmine arrives at her carbon copy negative image of a sister, Ginger (Sally Hawkins). Ginger’s life is that of poverty, hard work, and tough circumstances; yet unlike her glamorous sister she doesn’t talk the talk, she walks the walk. Jasmine, we quickly learn, lost all of her money and now comes to crash on the sister she couldn’t care less for while she had the money. What follows next is a journey to both past and present, where we learn the exact circumstances in which Jasmine and husband’s (Alec Baldwin) star rose and fell, and where we also learn of how Jasmine is now ensuring everybody else’s star falls, too. 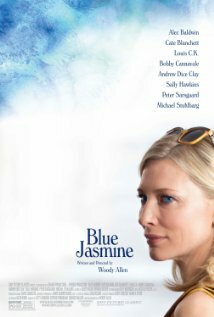 There is more than a bit of a Greek tragedy element to Blue Jasmine, including the fatalistic elements. Jasmine does not miss an opportunity to miss, yet Jasmine is the one that feels and acts as if she deserves everything while the unassuming Ginger carries all the weight. There is also plenty of catharsis to be had when we see how far the rich and mighty have fallen and how the meek are inheriting the earth. This leaves us with an actors’ movie, and yes – there is plenty of good acting to share. In my book, Hawkins wins the day, even if she’s portraying the role we grew accustomed to see her in. Perhaps because of my expectations, Blue Jasmine felt strange to watch. Perhaps because I kept expecting jokes to pop up I felt bored, almost betrayed; perhaps because I was delving too deeply into other people’s lives I was feeling uncomfortable. With the very notable exception of Ginger, there is no character in Blue Jasmine that leaves the scene unblemished: everyone is a criminal of sorts, and those that are not outright criminals are guilty of looking out for the trophy wife. I’ll be honest. Immediately after we finished watching Blue Jasmine I thought it worthy of 2.5 mutant crabs, being the strange and borderline painful experience it was. Then I noticed the movie growing on me: days later I kept on analysing events and characters in my head, till eventually concluding this convoluted movie is a work of art. The well crafted characters and the contrasts between them are what makes Blue Jasmine, and make it they do. Thus I will rate the movie at 3.5 crabs out of 5 and recommend it to those searching for a serious cinematic experience. Just don’t expect the typical Woody Allen experience.